"I came up with this recipe to serve with chicken fingers. I was tired of honey mustard, but didn't want all of the heat of straight Buffalo sauce. 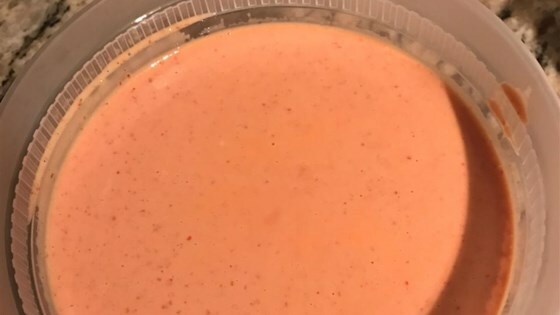 Here's my creamy and slightly sweet version that is a perfect dipper for anything from chicken fingers to fried shrimp!" Whisk mayonnaise, Buffalo wing sauce, and honey together in a bowl until smooth. This is a perfect dipping sauce! I served it with spicy chicken meatballs. It was a great side. Thank you! Made it and used it as a coating for baked buffalo shrimp and it was very good ! Loved it. Simple and delicious. The only thing I added was a touch of lime juice. Thank you for sharing. I was just okay, it was too soupy. I think it would be better with cream cheese rather than mayo. It was good mixed with refried beans as a spicy bean dip option.